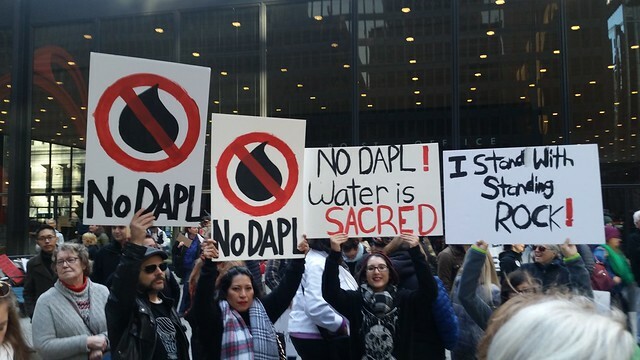 The resistance to the Dakota Access Pipeline (DAPL) has become a beacon for all Indigenous peoples and all the forces trying to resist the ruling system—and has been assaulted with ferocious repression. The camp in a remote and often freezing part of North Dakota began on April 1, near where the pipeline, which is to carry up to 570,000 barrels of fracked Bakken shale oil daily to Illinois, is supposed to dive underneath the Missouri River. Its route was shifted from Bismarck to the Standing Rock area because of concerns that white people’s water could be polluted by oil spills. Hundreds of solidarity actions have taken place across the globe. (See reports on this page.) Where DAPL is to cross the Mississippi River in Iowa, a resistance camp began in August. Women there have blocked construction several times. This struggle is about Native American sovereignty (see also “Demand Indigenous Peoples Day“), action on climate change, and environmental defense. It has become the front line in the clash between the existing capitalist system built on oil, coal, natural gas and nuclear power, and the reach for a new kind of society where human power is its own end. That is manifested in the battle to stop the civilization-destroying momentum of always extracting more and more fossil fuels and uranium from the ground. Years of the climate movement finally drove President Obama to put his foot ever so lightly on the brake. But Donald Trump, who has investments in the company building DAPL, has promised to push the throttle to the floor, including restarting the Keystone XL pipeline halted by Obama. 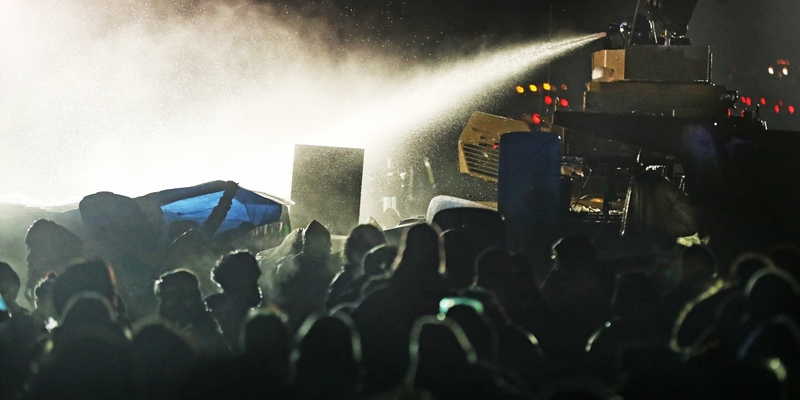 So it is that a band of nonviolent water protectors in a remote rural area found themselves under attack by hundreds of heavily armed police from seven states plus private security. Over 400 people have been arrested. Another camp, the 1851 Treaty Camp, was set up in the DAPL path, reclaiming unceded Dakota territory included as part of the Standing Rock Reservation in the Ft. Laramie Treaty of 1851. Police violently cleared it. They used tear gas and pepper spray, concussion grenades, shotguns firing bags full of lead shot (“bean bag rounds”), rubber bullets, tasers and a sound cannon. Cops hit two medics with batons and pulled another medic out of a car he was driving. Another water protector jumped into the car to stop it from running people over. The world recoiled at images of vicious dogs, snouts red with their victims’ blood, and of wounded protectors confronted by ranks of fully militarized police in riot gear, deploying military-grade Humvees, armored vehicles and assault rifles. Just as such images brought intense attention to the Black freedom struggles in 1957 Little Rock and 1965 Alabama, video from North Dakota in September finally broke through the virtual media silence. In retaliation, Morton County issued an arrest warrant for Democracy Now’s Amy Goodman and later arrested two journalists from Unicorn Riot. Once again the freedom movements have exposed the hollowness of so-called American democracy. Where Presidents Eisenhower and Johnson were finally forced to send in the National Guard, no such move has yet been made by the current administration. The federal government has not even followed its own laws. Not only did the Army Corps of Engineers fail to consult the recognized tribal government, it issued permits without a full Environmental Impact Statement and in violation of several statutes. When DAPL construction intentionally destroyed numerous sacred and cultural sites in order to preempt their protection, the Corps failed to invoke the law that would, based on this violation, prohibit issuing any more permits. Instead, President Obama tried to defuse the movement by calling for the Corps to consider rerouting the pipeline. “Don’t reroute it! Shut it down!” was the deafening response. The struggle in North Dakota is a powerful manifestation of the vast forces stirring to put all of American civilization on trial. The time is now to support this struggle in practice and in thought. This entry was posted in Articles and tagged 1851 Treaty Camp, Amy Goodman, Bakken oil fields, Barack Obama, Bismarck North Dakota, Camp of the Sacred Stones, Cannon Ball North Dakota, capitalism, climate change, Dakota Access oil pipeline, Dave Mahoney, Donald Trump, environmental movement, Eryn Wise, fossil fuels, Indigenous peoples, Indigenous women, International Indigenous Youth Council, Iowa, Keystone XL pipeline, Lakota, Linda Black Elk, Native Americans, North Dakota, Police brutality, Standing Rock Sioux Tribe, U.S. Army Corps of Engineers, youth. Bookmark the permalink. In October, the National Indigenous Congress (CNI) held in Chiapas, Mexico, its fifth convention. At the end of it, the peoples presented a document with 26 summaries describing how capitalism is trying to take away their lands and how they are resisting against it. The 27th summary was a salute to the defense of the Dakota Nation sacred territory (see http://enlacezapatista.ezln.org.mx/2016/10/18/may-the-earth-tremble-at-its-core/). Native Americans have thus been recognized by Indigenous people in Mexico as part of the same crusade they are on for the defense of Mother Earth and for the construction of new relationships between human beings and Nature. Our practical and theoretical support should be given to the Indigenous peoples, who are in the front line of this battle–maybe the most important one we are facing nowadays. In that sense, the page on the Standing Rock Resistance from the Nov.-Dec. 2016 issue of News and Letters is quite significant. It not just contains activity articles that let us see first-hand the actions and ideas of the people defending the Dakota Nation (both Native Americans and others who support them), but it has also an editorial which puts forth the meaning of this struggle. This is the kind of practical and theoretical support that radical activists should give to the movements from below, whose ideas and actions are the only ones that can bring us closer to a totally new society.